Buy Tails From The Dark Dragons Inn a Coffee. ko-fi.com/darkdragonsinn - Ko-fi ❤️ Where creators get paid by fans, with a 'Buy Me a Coffee' button. 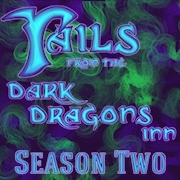 Tails from the Dark Dragons Inn is a weekly, serialised, high fantasy, improv fiction Podcast driven by table top roleplay. Hosted and Game Mastered by Ray accompanied by his players, Tom (Erbak), Liz (Tobe), Vinny (Mhurren) and Nina (Myx), he invites you into a world both familiar and strange; a home-brew alternate version of the Forgotten Realms. Welcome to the Dark Dragons Inn: Every episode is lovingly crafted by a team of gnomes that require a huge volume of sustenance. Please help us keep them swimming in caffeine so we can keep their ears filled with audio for them to transcribe for those in our audience who need a little help to get by. Secured Payments. Support goes to Tails From The Dark Dragons Inn's account. Upgrade Tails From The Dark Dragons Inn to a yearly Gold Membership with a one-time payment.